As you all know, I am behind (not even going to say how far!) in updating the Perfect Picture Book List. One of my problems is that Blogger overloaded due to how much I was trying to put on that page. I’m trying to sort out a better system. Stacy, the wonderful and generous, put together a possible plan which I haven’t had time to figure out yet, but in the meantime, at the very least, I have two (2!) things to mention. 1. I am experimenting with using Pinterest for the theme lists, so many Perfect Picture Books, grouped by theme, are on Pinterest HERE. There is a theme list on the new blog and it is complete – all the themes are listed alphabetically, and they connect to the Pinterest boards… but the Pinterest boards are only partially loaded. There is a list of contributing bloggers on the right side of the new blog which I know is incomplete. If you’re a contributing blogger whose site isn’t mentioned, please feel free to email me and I’ll add you in – I just couldn’t remember everything off the top of my head so have been adding slowly as I go along – and I apologize for not getting you up there already! Links To Resources: talk about family traditions: what are some things you do as a family? How are these things alike or different from what other people do with their families? Do you think people are “weird” if they do things differently? Discuss things to do together as a family. In this book, the kids are completely focused on joining the circus while their parents concentrate on being dull – in a group or individually, think up and illustrate another Dullards story where the kids have a new plan and practice making the story say one thing while the pictures show another. Why is this funny? Perfect Picture Book Friday – High-Tailing It Out Of The State! Fainting at the sight of flowered wallpaper? I'd love to meet Mrs.Dullard! Good luck with the PPBF solution crisis, and if we can help by uploading out picks on multiple sites/locations let us know! Three cheers for Stacy for trying to help! This looks like a great book to read on a dull and boring day! This book does sound FUN! I can't wait to read it. I am checking it out right now along with The Stupids. I love picture books that make me laugh. Stacy is a dream come true. She is wonderful and I hope things get sorted out.. I wish for you an eighth day. I like what you have done so far in pinterest and am going to check out right now. I am so up for books that are simply FUN! Thanks for all the work you put in to making PPBF as accessible and useful to as many as possible. I haven't read this one. Thank you for taking the time to list all the PBs! I also meant to say I have a board on Pinterest for PPBF as well. When I went to pin your site on my board it didn't pin. Don't know why but I wish it would. I did pin your photo and the PPBF logo though as that was all it allowed. A funny book and clueless parents–sounds like a winner! To keep from getting sucked into another time-waster I haven't joined Pinterest, but now it looks like you have given me a reason to (sigh). OH does this EVER sound hysterical! Requesting it from my library! And you are AMAZING, Susannah. Thanks for all you do for those perfect picture books. WOWOW. The Dullards sound like fine neighbors, if you ask me. And this sound like a hilarious book. When my son was little, I used to tell him a story about the Boring family (to which nothing ever happened) to bore him into sleeping. It didn't work all that well. I wish I'd had this book–although I'm sure it would have had him laughing instead of sleeping. It sounds (and looks) hilarious! Love the book…I need to read more funny books to use them as mentor texts because I want to infuse more humor into my stories. Susanna…I am totally there with you on the overwhelm issue. What is happening to time? Has it fallen into a black hole? Did aliens come and steal it away? Is the thinning ozone layer to blame? Hey…maybe that would make a cute picture book! See, that's the problem…everything I see and hear becomes a story in my mind and I want to sit down and write it. Home-cooked meals and clean laundry are over-rated, right? I leave for Chicago on Tuesday for a week of family visits…and need to get this house in order and food prepared so that hubby will not be lost while I'm gone. Have a wonderful weekend, Susanna! Thanks for this book suggestion. It looks VERY funny. 'Can't wait. And I LOVE the new alphabetical list! How did I miss that before now? I'll be adding it to all my posts. Great resource, thanks! Back from spring break and out from under the daunting pile of emails. It took me a week. Geez….I'm slow. And I can't believe how much work it must be to list all those books in any kind of order. I would not be up to the challenge. Good luck! First off, thank you for all of your work on creating and maintaining Perfect Picture Book Fridays. I have learned about some of our favorite picture books through your site. I really appreciate all of your work. It is an amazing resource. 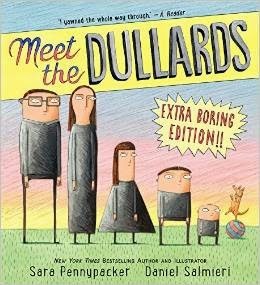 Meet the Dullards looks like a lot of fun and very funny! I look forward to reading it! Hope your spring break was wonderful, Jilanne! And glad you're a Dullards fan too 🙂 As for the list… if I could just catch up and then be disciplined about keeping up it wouldn't be so bad!!! Glad you like the book, Vivian! It's a funny one 🙂 And although I'm sorry you have time struggles too, I'm glad to know I'm not the only one! Stacy is the cat's pajamas and one of these days I'm going to sit down and see if I can understand her system enough to use it 🙂 I hadn't thought about having her organize my life, but now that you mention it… 🙂 Have a great time in Chicago and enjoy your family!!! It's very funny, Mike 🙂 I think you'd like it! I know, Joanna – me too! I love fun books 🙂 And you're welcome… but I don't do nearly enough or it would be way more organized and caught up! It IS fun, Clar! I hope you like it. Hmm… that is odd. But then again, I don't really understand how Pinterest works. But it seem like it should have pinned… And P.S. I sent you an email – I did put links on Edmund – sorry for the delay – and if he's not on the Pinterest board yet I'll try to get him there soon. We all appreciate the never ending work you do the PPBF page. Bless Stacy! Haven't heard of The Dullards. The cover looks like a dull book. But, the magic seems to be inside the pages with the humor. This sounds soooooo good. I'm happy my library has it. I just ordered it up. Thanks for telling me about it. Ha ha! I think Mrs. Dullard would like me. You're very kind to say so, Diane 🙂 I'm not sure I do a very good job of keeping up, but I do love PPBF and all you awesome folks for being such staunch supporters and awesome contributors and making it all that it is! The cover looks dull on purpose, Pat 🙂 The juxtaposition of art and text is really fun 🙂 At least I think so… let me know if you read it what you think! Sound like a good read, and a good laugh, which i'm always up for! Maybe it's good we don't have that eight day… Imagine how much more we'd keep on packing in. Thanks so much for everything you do, Susanna! Hi!!! I can't wait to read this one! Sounds like so much fun. Not dull at all. Ha! I know – isn't the Dumb Bunnies great? And this one is so fun too!